Bristol Temple Meads is the main railway station for Bristol and is only a 15 minute walk from the Old Market area of Bristol which is the location for many venues that are of interest. Bristol Parkway is Bristol’s second railway station and is in the north of the city. You can catch trains to Bristol Temple Meads from here or take the no. 73 bus into the city centre. First Great Western is the main railway company that serves the west country. Bristol Bus station is located in Malborough Street, near to the central shopping district of Bristol and is about a 25 minute walk to the Old Market area. 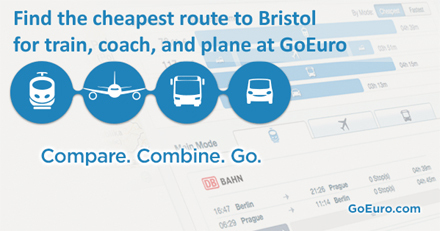 National Express run services to Bristol from all major cities in the UK. MegaBus also serves Bristol and will drop you off outside the famous Colston Hall in the centre of Bristol. First Bus is one of the bus and coach companies that serves the area. Bristol International Airport is located about eight miles south west from central Bristol. The A38 runs from the airport to the city and there are regular buses (Bristol International Flyer) from the airport to the centre of Bristol. Key carriers: easyJet, Ryan Air, Flybe, KLM. Bristol is easily accessible via the M5 and M4 motorways. From the M4, exit at junction 19 (signpost to Bristol) and follow the M32 into the city centre. From the M5, exit at junction 18 and follow the A4 Portway (signpost Bristol Airport) into the city centre. The Old Market area of town is near the end of the M32 motorway. Route Planners: AA, RAC, Michelin, Google. Fuel Cost calculator.